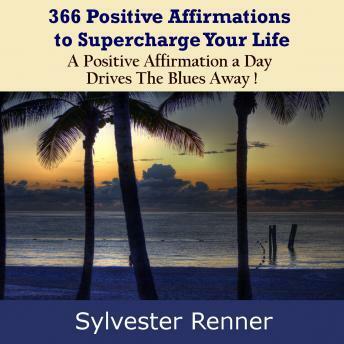 366 Positive Affirmations to Supercharge Your Life: A Positive Affirmation a Day Drives The Blues Away! Life Changing: These booster shots are sure to uplift and turbo-charge your life. A comment from one of our users reads: "The use of these positive affirmations have helped me change my attitude and improved my entire life." The audiobook is more than just a collection of affirmations. It also includes 2 bonus features / chapters: Firstly, a "How to Guide" that walks you through the process of using affirmations or making affirmations a part of your daily life. Secondly, the author shares his personal journey with affirmations – the role that they play in his life, the limitations of affirmations and the need for going deeper - developing a relationship with God.